This post contains affiliate links. If you click on a link and buy something, I may get a portion of the sale at no cost to you. I have affiliate links so I can promote products and services that I think are excellent. It also helps me make a living off of this site so I can keep creating awesome content for you. Thank you for helping me work from home. The best person to teach how to bullet journal is of course the inventor himself, Ryder Carroll. Here is the link to his video. According to Ryder Carroll, a bullet journal helps you track the past, organize the present, and plan for the future. 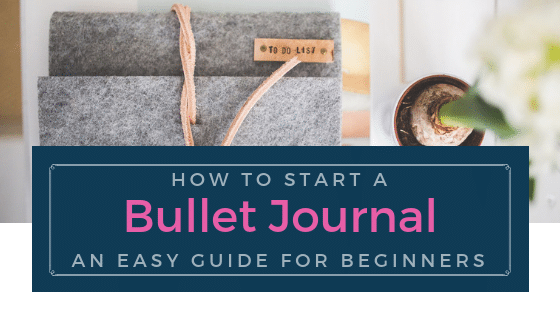 In other words, a bullet journal is a very handy tool to organize your life. If you watched the video, it’s really just so simple to start one, and that’s the focus of this article. 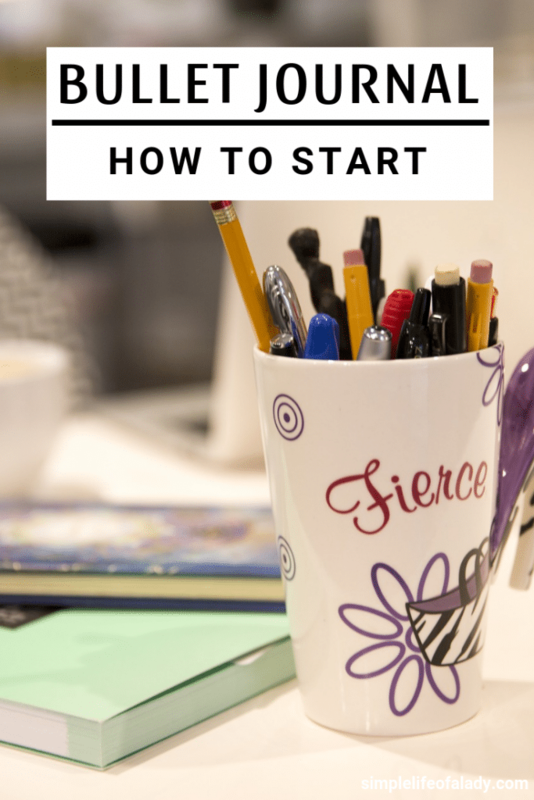 I’m here to show you the basic steps to follow (which I did too) to get started on bullet journaling. Now don’t freak out if your BuJo doesn’t look like any of those artistic ones you see online. You can have something like those too, but for now, focus on learning the ropes first. Focus on your organizing needs because that’s what the bullet journal system was originally made for – to help you organize your life. You can think about the art works later. 1. Have a notebook and a pen ready. You can use any notebook to start, but using dot grid papers is the standard in bullet journal. By experience, dotted papers are easier to use than ruled pages. This is because, the dots serve as guide when you draw symbols and designs, something that lined paper doesn’t have. Popular notebook among bullet journalists is Leuchtturm 1917 Dotted A5. You can purchase it from Amazon. It comes in different colors. Now before you jump to a notebook like that of Leuchtturm, you may want to have some practice first. And with that, you will need some dotted papers to practice with. I created a dot-grid-paper printable that you can download and print for as long as you want. These come in three different sizes – Letter, A4 and A5. 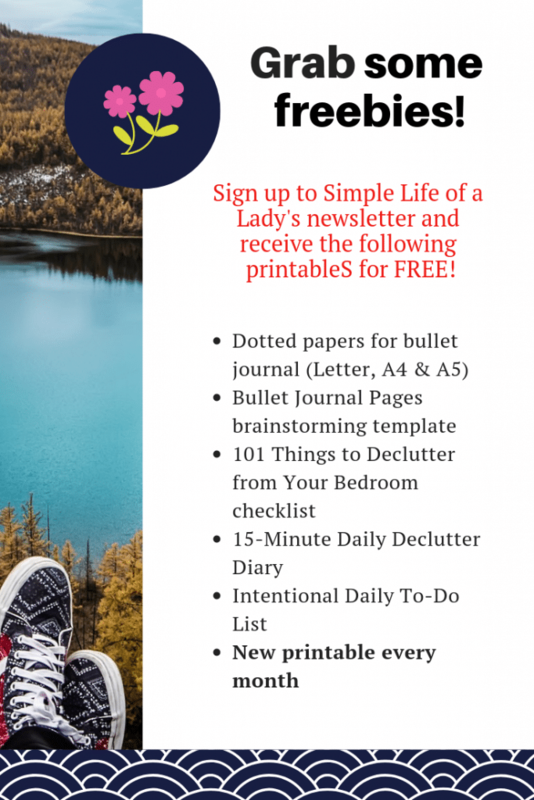 All you need to do is subscribe to Simple Life of a Lady’s Newsletter and you can have them for FREE! You’ll also get access to all of my freebies! I’m giving away at least one free printable every month. So as long as you are a subscriber, you can expect to receive a free printable in your inbox every month, for life! Click this link and it will take you to the sign up page. Now when it comes to the pen, again, just like the notebook, you can use any pen. I recommend a Frixion Erasable Gel Pen. It’s an everyday writing pen and what I love about it is that you can erase it when you make a mistake (which can happen very often). The Index page works like a Table of Contents. List here all the pages in your bullet journal, along with their page numbers. At first, this is blank, as you haven’t created your pages yet. But as you make your pages, fill this one out, so that later, it’s easy for you to locate each of your BuJo pages. 3. Determine the pages that you will need. To get clear on the pages that you need to put in your bullet journal, ask yourself, What do you often organize and track? I’ve included another printable in this post – Bullet Journal Page Ideas Brainstorm. Use it to record your answer to this question and to three more below. If you subscribed already, then it’s included in the email with the downloads. Just print it and write down your answers. If you haven’t subscribed yet, here’s the link again. Now this question will help you clarify the things that you often track on paper. So whatever you answer here will be the pages needed to be in your bullet journal. When I setup my bullet journal for this month, here are my answers to this question. Beside it is the BuJo page that I created to meet my needs. Okay… those are the pages that I’m sure I’ll be needing so I got to make sure that I have them all covered. Now it’s your turn to do the exercise! When you’r ready, go to the next step. 4. What habit do you want to start? Perhaps you want to start writing more consistently. Or you want to wake up an hour earlier. Maybe you need to monitor your water intake. Make sure you get eight glasses everyday. Or maybe it’s food… you want to cook healthier meals for you and your family. Whatever habit you want to start today, have a page for it. I’m saying HABIT… not habits. Well this is because being successful in learning just ONE habit, is better than starting a dozen ones, only to stop after a few days or weeks because you lost your motivation. So start with just one today. Continue building on it for 21 days. Twenty one days is the minimum required to form a habit, though some people need more. You can extend it to 30 days to make sure. By this time then, you can already add it to your habit tracker. Or start making a habit tracker, if you don’t have one yet. This is to make sure your newly formed habits really stick while you start building on another. Stay consistent for a year and you have formed 12 new habits by the end of the year! How awesome is that? For a detailed discussion on Habits, I recommend reading Better than Before. It’s a New York Times Bestseller written by Gretchen Rubin. It’s definitely one of my favorite books. There is no one-size-fits-all solution in building habits. What method works for another may not necessarily work for you. And this is normal. Don’t freak out. In her book, Gretchen Rubin details every approach that actually works. So you can see for yourself what method works for you personally, and keep applying it to all the habits that you want to form this year. 5. Decide on what symbols to use. There are many symbols to use. As a start, use a few symbols only, and focus on those you can easily draw. I found this Key Page online and this is my favorite. I actually copied this on my own bullet journal. Here’s my own version, just without the colors. I just added one more symbol for my top priorities. It’s very simple and has less than 10 symbols! For me, the less it is, the better it works. On a separate sheet of paper, write down the symbols that you will use to represent items in your bullet journal. When you’ve finalized it, just transfer it to your BuJo. 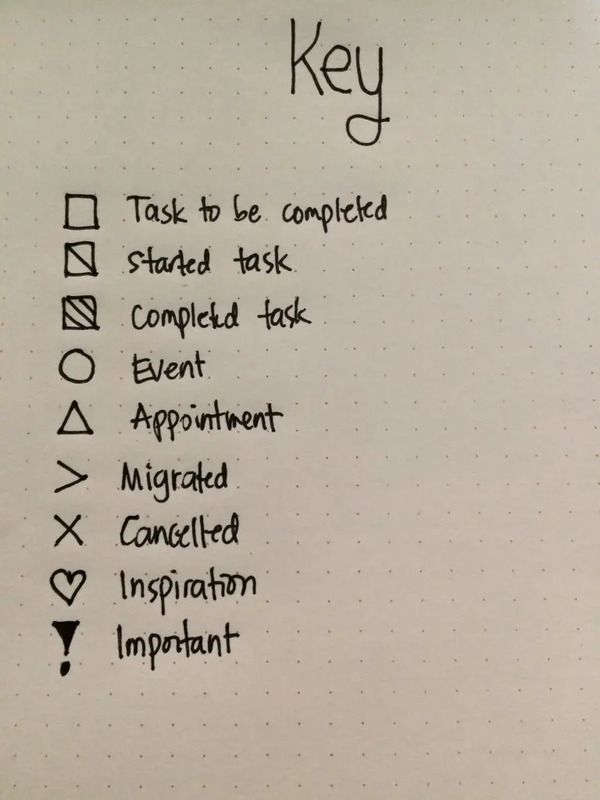 If you downloaded the Bullet Journal Page Ideas Brainstorm, there’s a space for drawing your symbols in there. You can copy the symbols shown above if you think you’re comfortable with that already. To know if you need more, go through the pages that you will create and determine whether each page needs different symbols for its contents. 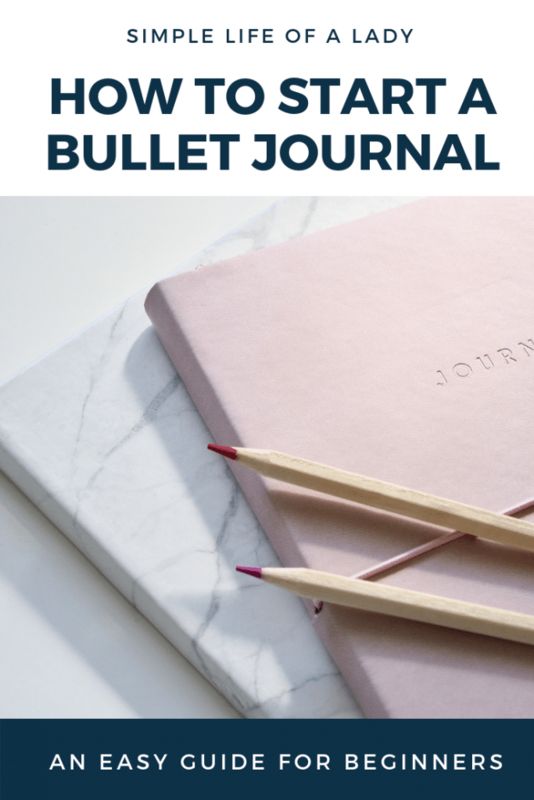 Just what kind of bullet journal do you want to have? Is it with a few doodles somewhere along the pages? Do you prefer a journal with colorful formats, drawings and symbols? Or maybe you want something simple like that of minimalist bullet journals. The designs of your bullet journal will depend on your preference to this. To be honest, what drew me first to the bullet journal club wasn’t its function, or the fact that it can make organizing easier and handy. What interested me were the beautiful and colorful designs of each pages that I saw on Pinterest. The twist is I’m not good at designs and colors. My bullet journal is very far from the pages that piqued my interest in the first place. But, I must admit. Having a bullet journal makes a lot of organizing easier to do. This is especially true for a notes addict like me – who has always something popping into her mind, having the need to write it all of a sudden, only to have to come finding it again, because she only wrote it on a piece of paper that was already thrown, misplaced, maybe gone with the wind? So what I’m saying is, you may want your BuJo to look like the ones on Pinterest. Maybe you want those beautiful designs. But if you can’t right now, don’t let this stop you from trying this wonderful system. Focus on how it can help you instead. Don’t fret about the designs or the colors. Experience the system first. You can always start with the minimalist style. Then, as you move forward, start copying some designs you love. There are bloggers who even share their designs online so you can just download, print and paste them in your BuJo. You may want to start exploring your creative side too. Learn to trace those dots and see what designs you can come up with, yourself. 7. Continue adding a page/collection as the need arises. As you go through your daily hustles, something new to track can always come up. Add a new page or collection accordingly. And don’t forget to update your Index as you add more pages. Again, the supplies you need to start a bullet journal are only a notebook and a pen. But if you’re comfortable spending a little extra money, these excellent materials are certainly worth the price. You can buy all these from Amazon. Aside from the pages being dotted already, these are also numbered. So you can easily find a page. It also has a built-in Index, so you don’t need to make one anymore. Each notebook comes with two ribbons that you can use to keep tab on a page. Amazon offers a variety of colors for this notebook. Feel free to select the color that you love! Gel pens write smoothly. The lines are fine. Even if you write quickly, there are no skipping. So you can have a nice, clean writing experience with these pens. Very ideal for everyday writing. If you want something darker for page titles, use a Pilot G2 Gel Pen. It’s not erasable like the Frixion pens, so if you want your titles or designs nice and clean, use pencil first, then later trace it with this pen. Frixion pens have colored ones too. Just like the black one, you can write with ease with these pens, without the fear of making mistakes. When creating a spread or designing a page in your bullet journal, use a pencil first, then just trace that with ink. Even if you have an erasable pen, it still pays to use a pencil first when drafting your designs, especially if it’s a very intricate one. You will draw lines in your bullet journal, that’s for sure! Make it easy to make those lines by using a ruler. I recommend this ruler because it has a non slip cork base, so it won’t slip when you’re using it. Having a bullet journal is not about getting everything done correctly all at once. This is about using a system that has worked for many, finding out how this can work for you too. And usually, when you’re just starting out, you’re going to make a lot of mistakes. So don’t compare yourself to others, especially with those who are more artistic than you and have very beautiful designs in their BuJo. Rather, let these samples inspire you. 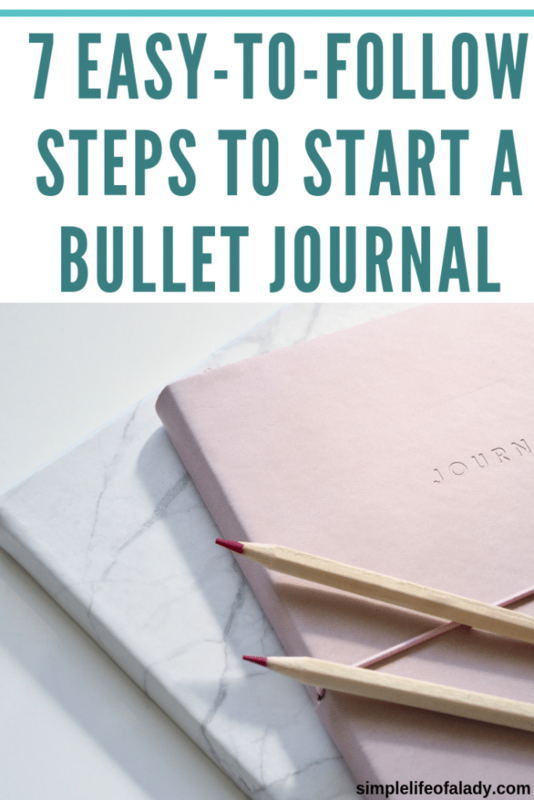 Let these be something that propels you into learning more about the bullet journal system and how it applies to your life. And in all these, don’t forget to have fun! Because filling up your bullet journal is a lot of fun! Loved this post? PIN it to let others know about it too.